Bergen is unique; not only because of its beautiful setting on the west coast of Norway but because of its iconic natural surroundings. Strolling around old streets and alleyways where people have lived for centuries, passing small houses, cobbled streets and overhanging galleries is like a fairytale and step back in time. In a similar fashion that Seattle is considered to be the gateway to Alaska and Asia, Bergen’s proximity to Norway’s fjords dub this city as “the gateway” to the fjords. I was in Bergen for three days and was eager to experience what this Seattle Sister City had to offer. The Seattle – Bergen Sister City relationship began in 1967 and was the second established Sister City relationship after Kobe, Japan. Bergen’s Nordnes Park has a totem pole gifted by the city of Seattle celebrating the 900th anniversary of Bergen’s founding and Seattle’s Ballard neighborhood has a park dedicated by King Olav of Norway. Additionally, as a designated European city of culture, Bergen boasts museums aplenty, UNESCO World Heritage sights and a trendy music scene. Immediately, I knew I was going to like it here. My first stop was to the UNESCO World Heritage site Bryggen along the harbor. If you’ve ever seen an image of Bergen, it’s most likely from here. 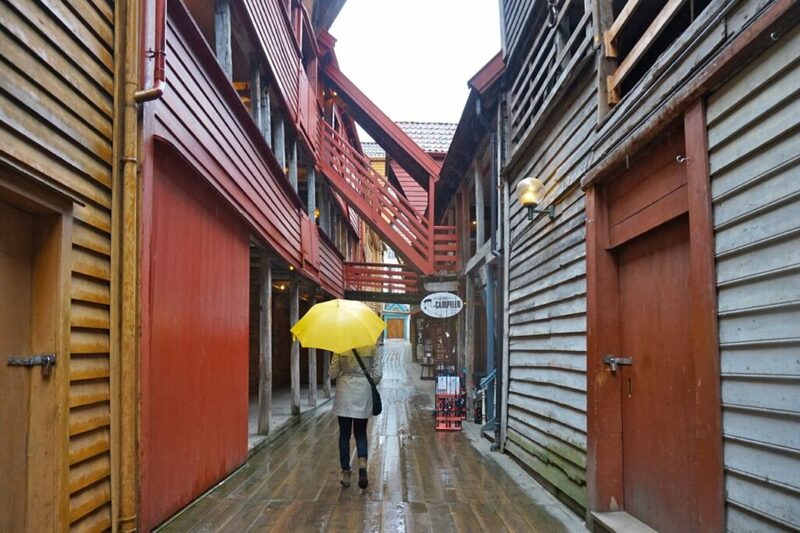 Bryggen is the oldest part of Bergen, dating back to the 1300s and is still in active use today. The brightly painted buildings hide a labyrinth of wooden alleyways and small staircases leading to cafés, art galleries, specialty shops and pubs. 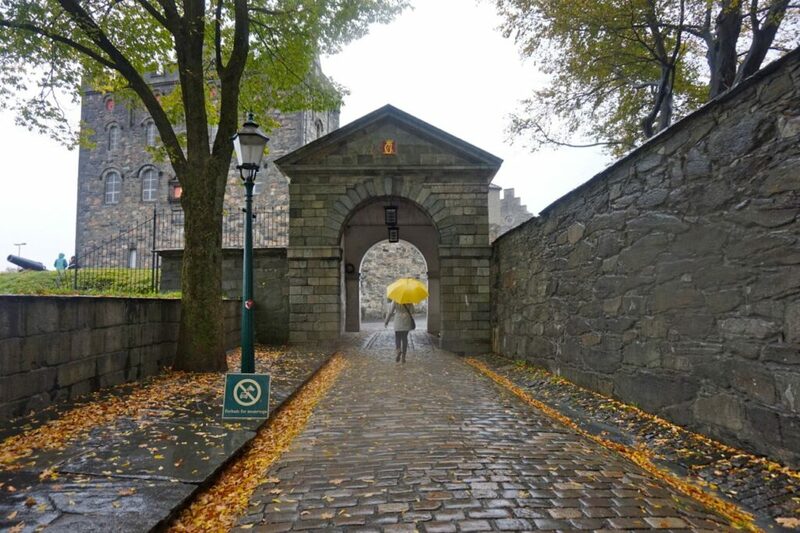 As rain began to fall, I ducked under my umbrella looking at my soaked feet and remembered, as the locals say, “there’s no bad weather in Bergen, just bad clothes” – something we Seattleites should take note of. I found cover inside an old fortress just past the popular Bryggen Museum. The fortress is named Hakon Hall after it’s first builder King Hakon in the 1200s. 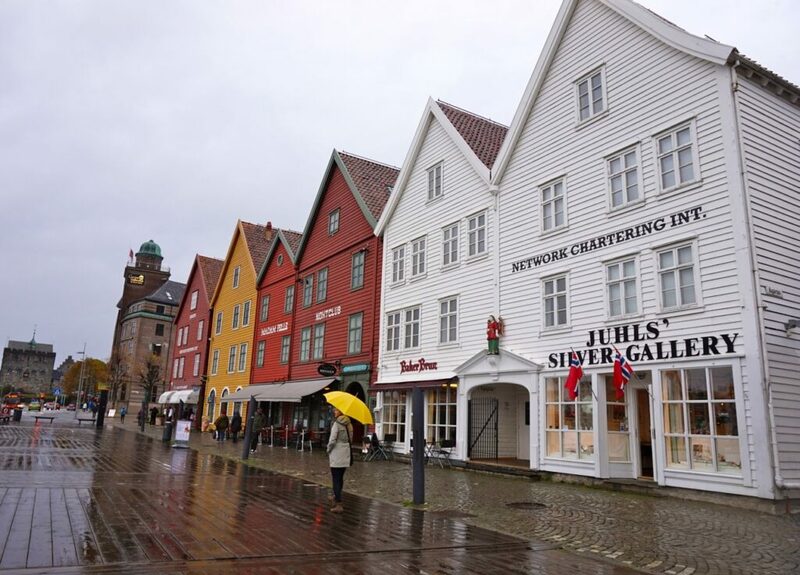 It was the largest and most imposing building when Bergen was the political center of Norway. 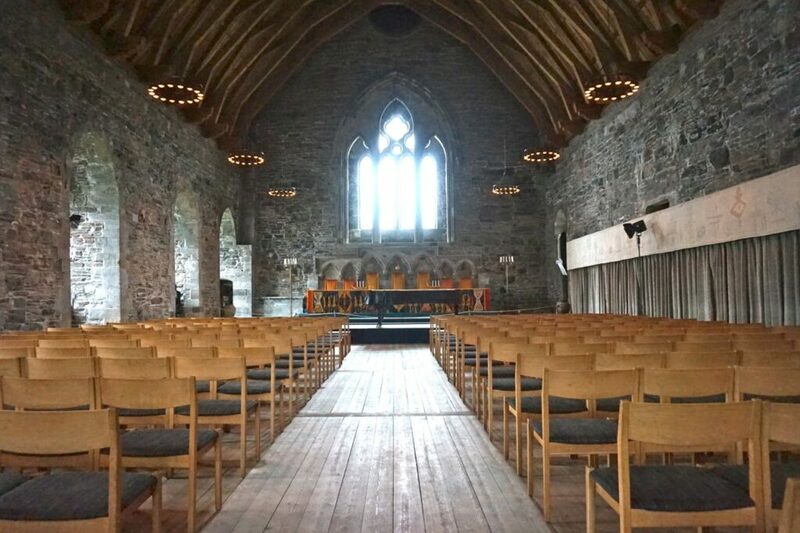 It has taken many shapes over the years, from a coronation hall to a massive storage unit, which allowed the building to be so well preserved. I visited the Bryggen Museum afterward to get an idea of what this city was like in the Middle Ages. The museum was built around original 12th century foundations and houses archeological findings from all over western Norway, providing insight into medieval Norwegian life. 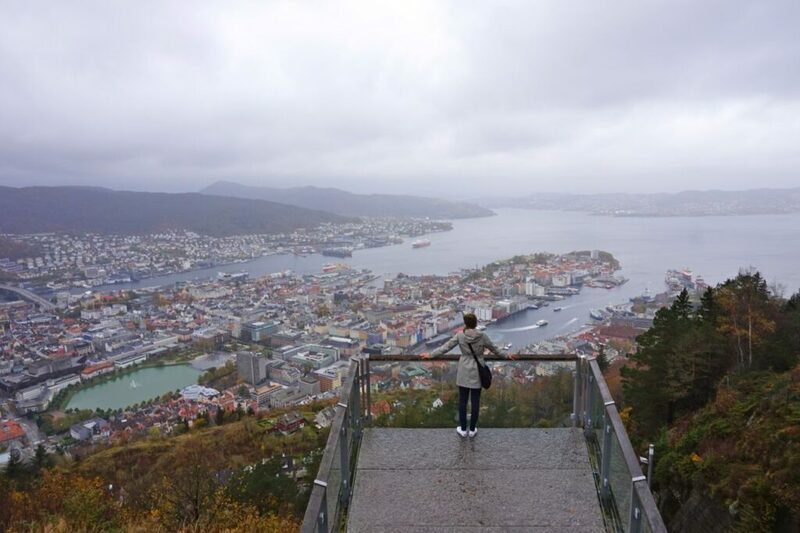 The following day, I walked back through the Bergen city center admiring how clean and quiet the streets were, making my way to the Floibanen funicular cable car for a birds eye view of the city and coastline. It’s a 7-minute ride up to the top of Mt. Fløyen, one of seven mountains that surround Bergen. There is a detailed trail system providing opportunities for walks around the mountain and back to the city center. Walking around the wet trail and lush forest I almost forgot where I was. 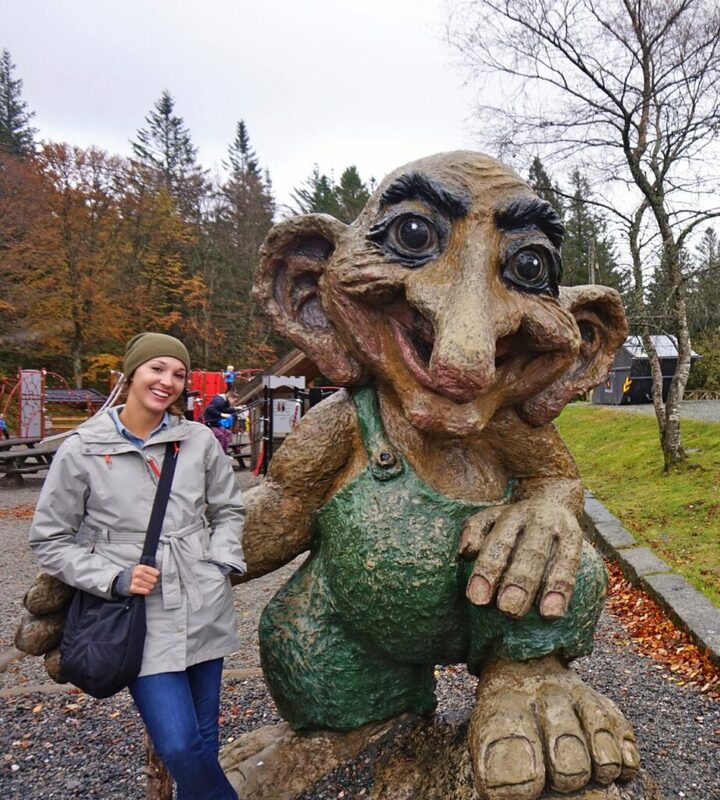 I felt like I was hiking in the Cascades, but several giant wooden trolls scattered throughout the forest quickly reminded me I was in Norway. Standing on the edge of the viewing platform, I spotted cruise ships leaving for more northern parts of Norway and ferries heading to the thousands of islands lining the coastline and into Norway’s famous fjords. Bergen is a starting point for the “Norway in a Nutshell” route which includes a train, bus, boat combination through Norway’s most narrow fjord, the Naeroyfjord. Taking the Floibanen cable car back to the city center, a heavier rain began to fall and I raced into the KODE Art Museum. I toured an exhibition showcasing local artist’s work, a collection of unique sterling silver artifacts and even spent time viewing an exhibition on the evolution of chairs from the Middle Ages to modern times. 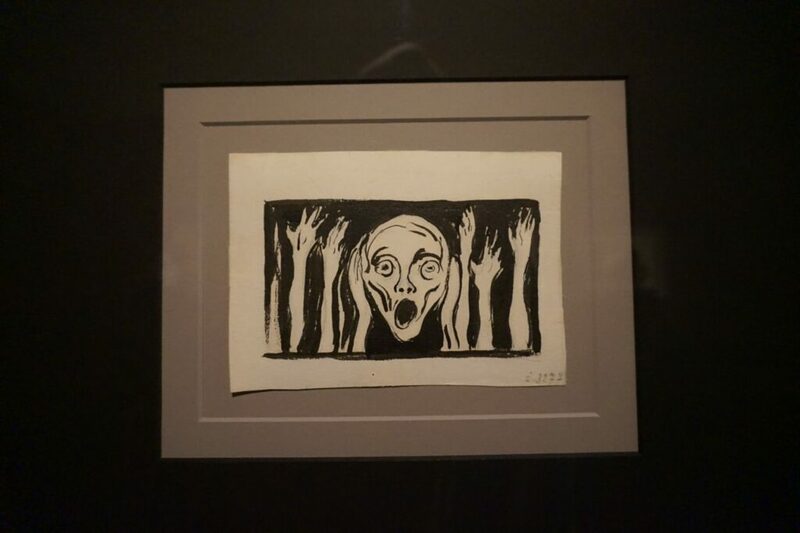 I visited the exhibition of artist Edvard Munch to see the most recognizable works in the museum. It was fun viewing his life’s work and seeing the transition of his styles. Ready for a bite to eat and live music, I walked along the dimly lit cobblestone streets back to the beautiful Bryggen area to Madam Felles, Bergen’s smallest music venue. Jazz music echoed throughout the alleyways and across the harbor, resulting in a packed house shortly thereafter. After only a short visit to this beautiful city, it’s clear to see that Bergen’s pristine setting and vibrant cultural life charms and rewards all who visit. This post is part of a series by Kim Edwards, dedicated to Seattle’s sister cities. Read more of the series here.